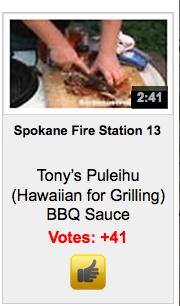 Don't forget you can vote again for Tony Yuen and Fire Station 13's video! 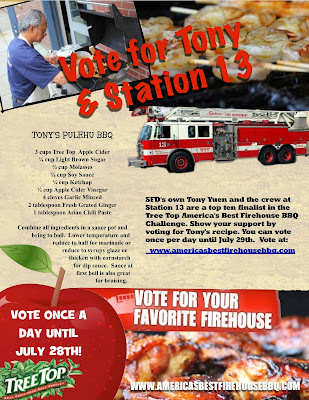 Vote for Tony Yuen's BBQ Sauce!!! Spokane Firehouse 13 cook Tony Yuen needs your help! Check out the video of Tony and the gang and then vote for it! Safety first. You may want to tarp your keyboard to prevent drool damage. Note: The rules required that videos had to be 4 minutes or less. On 06/22/11 at 13:14 hours, the Spokane Fire Department responded 3 engines, 2 ladders, 1 rescue, and 2 battalion chiefs to a reported structure fire at 2311 W Buckeye. First arriving SE3 reported smoke showing at the roof of a two story single family residence. Firefighters aggressively performed an interior attack on the fire while additional fire crews completed search and rescue, roof ventilation and salvage and overhaul. The fire was located by SE3 in the basement and extinguished. No one was home at the time of the fire. 6 fire companies with 21 firefighters responded to this fire. There were no injuries to civilians or firefighters. Damage by fire was confined to the basement and first floor, smoke damage thought out the structure. This fire is under investigation by the Spokane Fire Departments SIU. This fire is under investigation by the Spokane Fire Departments SIU. Fire was cnfined to the basement and first floor . Smoke damage thought out the strusture. On Tuesday June 21, 2010 at 5:41 AM, Spokane Ladder 4 and Engine 4 were dispatched to an automatic alarm at 4301 West Sunset. While the initial companies were enroute, Fire Dispatch received additional information from the business that smoke was present on the first floor. Fire dispatch subsequently upgraded the alarm to a full response adding 6 additional companies including 3 Engines, 1 Heavy Rescue and 2-Senior Ladders under the direction of Battalion Chiefs Moline and Haworth. Station 4 companies arrived within 7-minutes and reported a working fire in the first floor of the five-story hotel. Due to the topography of the hill, the first floor of this building is actually below grade. The fire was rapidly growing in a commercial laundry service area and had spread to large electrical utility components which created tactical concerns for the companies entering the fire area. The incident was upgraded by Chief Moline to a "working incident" and multiple companies were assigned to manage assisting the orderly evacuation of civilians and controlling the building's ventilation system. Ladder companies provided quick searches of adjoining areas while engines were utilized to support the building's standpipe system and stretch hose leads to the below-grade fire. It took 34 Firefighters just 20-minutes to locate and knock down the fire and control the incident. Firefighters were able to contain the damage to the primary service area on the1st floor and successfully prevented it from spreading vertically to the second floor or to any of the adjoining horizontal areas. The commercial electrical service was shut down and tagged out by Avista on-scene due to the severe damage and electrocution concerns to workers. No civilians or firefighters were injured as a result of the incident. The cause is under investigation by the SFD's SIU and the Hotel Management is assisted any displaced occupants. The building is not able to occupy this morning, but all efforts are being made to isolate areas in the building which can be used for safe occupation. Firefighters remained on scene for several hours, protecting the building's contents from additional damage during the salvage and overhaul operations. The damage to the first floor laundry service area is significant and does include severe damage to electrical components. The total dollar loss due to the fire was estimated at $25k-45k. We had a get together with the MDA folks and the Union and even a City Councilperson last week. Fill The Boot is scheduled for Sept. 17th this year so please put that on your calendars. I have a goal for getting so many off duty L-29 personnel to turn out that we have the lowest need for on duty folks in years. We are the 3rd highest Fire contributor for MDA in the State and they really appreciate our involvement although I sure wouldn’t mind seeing us climb a couple of spots! I would also love to see us start getting involved in providing folks for helping the local MDA with their camp over in Rathdrum. They love to have EMTs and Paramedics help out because these kids need someone watching over them but it is the time of their lives and many of them can’t wait for Summer Camp each year. I also wish to extend many thanks To Brian Turpin as he has been getting involved as well. The Union Officers and Bill Gonzalez are working with the City regarding the permit process. Jana Worthington and I are planning on getting some more info out soon and answering questions about how we can help. Let’s make this year with MDA the best yet!